Directional aim – my career path is adventure sports travel experiences: high mountain ski touring and blue water sailing super yachts. Long-term objectives include the Haute Route from Chamonix to Zermatt, cruising the South Pacific, circumnavigating the South American continent and expedition sailing in high latitudes with land trips in the Arctic and on Antarctica. I am also a freelance bilingual business administrator, management consultant, events, logistics and production manager for several clients in the Chamonix Valley, including Haute Pursuit and Ten80 Events. S/Y Carmella – Sparkman Stephens 92 ketch: first mate for delivery of yacht from Valencia, Spain, to St Martin, Caribbean, via the Canaries (Oct-Nov 2011). Dynamic Lives: resort manager for this luxury ski company in Chamonix Mont-Blanc, France. Overseeing 6 chalets, managing concierge service, arranging catering and travel, booking all snowsports, organising and managing corporate ski weekends. Booking luxury villas on Ibiza and arranging guest concierge service (Jan 2010-Aug 2011). Brama Yachts and Catamarans: base management for Greek charter business in Athens, looking after Bavaria 39s, Beneteau 44s and Jeanneau 50.5s, as well as Lagoon 420, 440 and 500 catamarans. Managing vessel inventories and client liaison. Deliveries around the Aegean. Freelance deckhand and hostess work on luxury super sail yachts (June-Sept 2010). S/Y Manu – Swan 70: first mate/cook for this high performance sailing yacht, supporting skipper in maintaining the deck, rig tuning and ran the interior, provisioning for long passages and cooking for owner and delivery crew (Dec 2009). 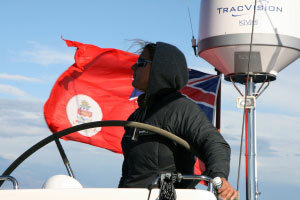 S/Y Ana Nefeli – Swan 75RS: first mate, running the deck of a privately owned high performance luxury yacht. Maintaining the boat’s immaculate condition. Cruising the Aegean Sea with owners and family. Working with Greek crew (July-Sept 2009). S/Y Velsheda – J Class JK7: day-work while boat in the yard in Palma de Mallorca, Spain. Interior detailing post varnishing, plus polishing deck and rig (June 2009). S/Y Oceana – Oyster 82: first mate/stewardess – second-in-command on three-crewed, privately owned luxury sailing yacht, with a busy schedule in the Mediterranean and Caribbean, comprising 5 star charters, cruising with the owners and family and corporate entertaining. In charge of running the deck, while underway and in port. Raced in the 2008 Oyster Mediterranean Regatta. Project managed a refit programme in Palma de Mallorca while the skipper was on leave. Delivered the boat to a tight deadline westwards across the Atlantic. Cruising and chartering across the Caribbean, from the BVIs to the ABCs. Raced in the 2009 Oyster Regatta in Antigua, then delivered the boat to Fort Lauderdale via the Turks & Caicos and the Bahamas (Oct 2008 – May 2009). Freelance Racing Mate: first mate for corporate racing on the Solent and around the Isle of Wight, onboard Elan 410s, Beneteau 40.7s, Farr 65s, Challenge 67s, Clipper 68s and Clipper 60s. Competed in many regattas including Cowes Week (May-Sept 2008). Ski Verbier: assistant resort manager, managing 20 luxury chalets, staffed by chefs, hosts and drivers; ensuring high standards of hospitality maintained, ski training and leading, client liaison and coordinating private transfers. Constant business dealings with local suppliers conducted in French (Dec 2007-April 2008). Global Yacht Racing: first mate for delivery of racer cruiser yacht Beneteau First 47.7 from Malta to the Canaries via Gibraltar (Oct-Nov 2007). Clipper Ventures: training mate recommissioning and maintaining 68ft ocean racing yachts. First mate on corporate day sails and deliveries of yachts between the South Coast and Scotland. Training new crew for the Clipper 07-08 Round the World Yacht Race. Race support at the start in Liverpool and the first stop in La Rochelle (May-Sept 2007). Chalet Le Verbiage, Verbier, Switzerland: chalet manager, cooking breakfast, tea and dinner for up to 10 guests, as well as hosting drinks and dinner parties for clients. Organising and booking ski training, guiding and associated snow-sports, including extreme activities such as heli-skiing, parapenting and off-piste ski-touring. Housekeeping the chalet like a luxury bed and breakfast (Dec 2006-April 2007). S/Y Elvis The Gecko – Oyster 66: second mate on delivery of luxury yacht from Palma de Mallorca to Antigua via the Canaries and Cape Verde Islands (Oct-Nov 2006). Clipper 05-06 Round The World Yacht Race: crew quartermaster on S/Y Western Australia Clipper, which won the race overall with three first places, six seconds and a third out of 13 races. RTW crew victualler – researched ocean yacht racing nutrition, planned menus, bought provisions and managed boat budgets. Oversaw below decks hygiene, order, health and safety. Also wrote the ship’s log for the website www.clipperroundtheworld.com (Sept 2005–Aug 2006). PADI Open Water Diver – fluent French speaker – 65,000 NM logged.